We offer airport transfer service to everyone and for all needs. We are proud of our extensive fleet of cars and services that fer. From modern comfortable buses to luxurious high class cars. Read all about the fleet here. 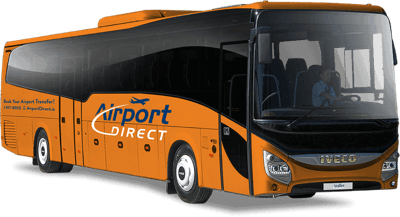 On our Airport Direct Economy we operate a brand new fleet of Iveco Evadys with seats for 53 people. and screens in every seat. Seats have been adjusted in order to provide more leg room. All seats can be adjusted from side to side to provide even more space. On our Airport Direct Premium, we operate a brand new fleet of Ford Transits with 8 passenger seats. A modern vehicle with comfortable leather seats and a good leg space. USB chargers and free wifi are available on all the buses. The Mercedes Benz E-class has an elegance in the design, flowing shapes that catch the eye. Extremely comfortable seats with massage. All the cars have high speed 4G internet. The V-class is a spacious sedan, combining elegance, comfort, style and luxury on a larger scale. extremely comfortable to travel in. The cars all have high speed 4G internet. Executive style of Mercedes Sprinter with High speed 4G internet. Scoda Superb limo edition has an elegance and luxurious design. Comfortable mini-van, with advanced technology. Flexible seats, good luggage space. Ford transit with 14 passenger seat. Perfect for groups, family and friends travelling together. A single-decker bus manufactured by Mercedes Benz. The spacious interior offers both seating and standing areas along with space for luggage and other items. 14 passenger Ford Transit, a nimble way to get to and from the Reykjavik Sightseeing terminal. This spacious vehicle offers plenty of space should you need to luggage along. A spacious and well lit interior provide a high level of comfort for trips to and from the Blue Lagoon.